So, considering that I had nothing better to do with myself except pack my suitcases and cardboard boxes for impending emigration, I decided to try one. 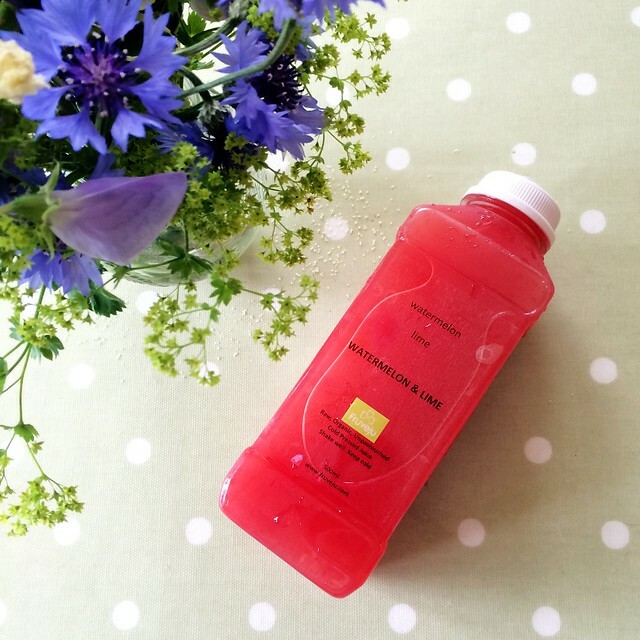 I’ve been following Fruveju on Instagram for a while, after Ella of Deliciously Ella posted about their juices, so I plumped for their one day cleanse. The cleanse consists of six juices of 500ml each. They come in various enticing colours and interesting sounding flavours. So, I was pretty excited when they arrived at my house. I had ordered online, and a very polite email had been sent to me to confirm when they would be delivered. Customer service is so lovely. The package arrived on the day as promised, delivered by courier. The juices were packed in a small cool bag, with an ice pack. They were still mostly frozen, and I put them in the fridge in the bag to wait a couple of days to start. The accompanying leaflet on how to make the most of the cleanse suggested adopting a vegan diet for a day or two before starting, and for a day or two afterwards. Well, I didn’t have time for that. I had training with Mark the Magic PT on Saturday and I ate what I wanted. Come Sunday morning, I was surprised to find the juices were still mostly frozen! The ice pack was still solid and cold, and the insulated bag had done a super job. I put them out on the kitchen counter to thaw out and decided to start the day with a cup of hot water and lemon, as suggested by the leaflet. Juice One was ready by the time I’d showered and washed my hair and faffed about for a bit. It was one of the two green juices for the day. Now, perhaps if I was more accustomed to drinking green vegetable juices or smoothies for breakfast, this might have been more palatable. As it was, I’m still learning to enjoy kale at the best of times, and I could really taste the kale and spinach. It was a little bit of a shock for first thing in the morning. I also hadn’t quite appreciated that 500ml is almost a pint. 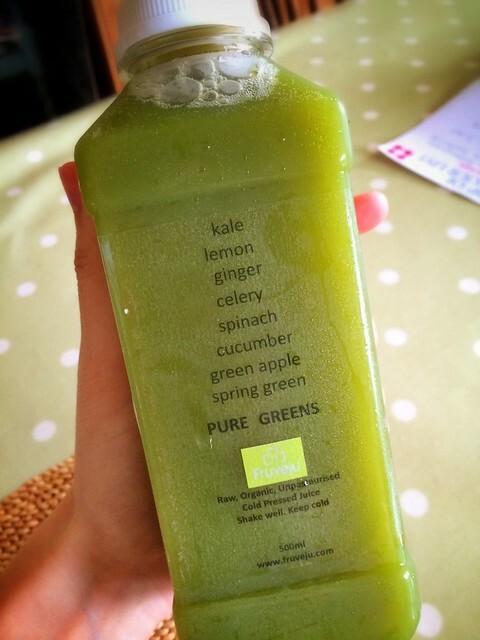 That’s a lot of iron-y green juice to get through. I took the advice from the website about how to get through it if it isn’t so delicious, and drank it through a straw. It took me a while to work through it, and I started to focus on the apple taste rather than the kale taste, and it improved. Onward! How hard can this be? All of the aforementioned cool kids had claimed not to feel hungry while doing this, so I was feeling confident. The second juice was rather delicious: watermelon and lime. I cracked open the third juice, another green juice. I became acutely aware of the metallic vegetable taste again. I struggled for a moment. Although my stomach was full of liquid, I didn’t feel satisfied, and I was definitely hungry. I’ve never been one to starve myself for the sake of it, so I caved and ate a toasted bagel with houmous and lettuce. It was epic. I continued to battle with the green juice. This was getting more difficult. I had three more juices to get through after this, and I was already sick of juice. I started to notice the slightly grainy texture. The juice is thin, but as it reached the back of my mouth, I could feel the small particles of vegetable on my tongue. It wasn’t all that enjoyable. 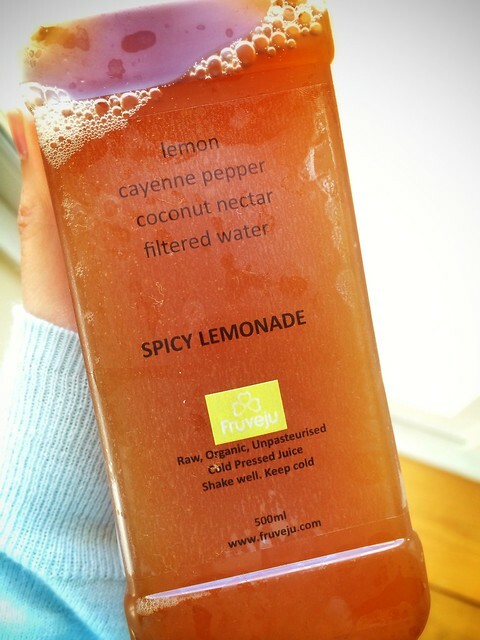 The next juice was this “spicy lemonade”. At first, it didn’t taste too bad: almost like honey with a mildly spicy finish. And by “at first”, I mean the first three sips. After those, the sweetness was sickly, and the cayenne was kicking my arse. With every swallow, the pepper would irritate the back of my throat and make me cough. The grainy texture was even more noticeable. I’ll be honest. I barely got through a quarter of this one before I considered pouring it down the sink. It was unpleasant. I didn’t want any more juice. I constantly needed a wee. I wanted macaroni cheese. Out of sheer stubbornness, I cranked my way through the lemonade, but it took me two hours. 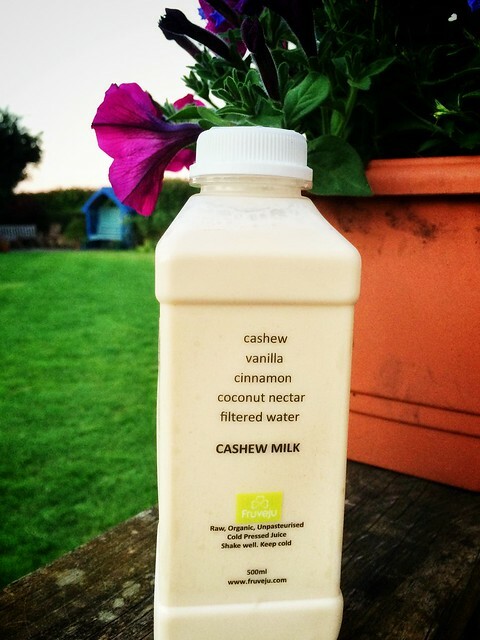 I’d have taken another green juice over this one in a heartbeat. I was glad to see the end of it. 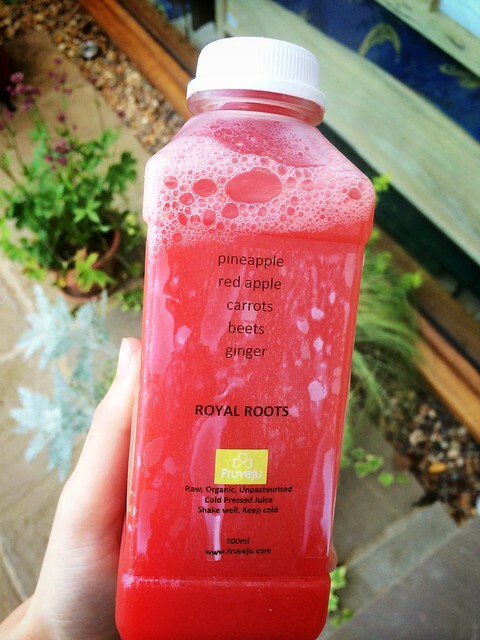 Fifth juice: the Royal Roots flavour. I’m still learning to enjoy beetroot, and tend to only eat it in a very flavoursome soup that hides the earthiness of beetroot with tangy orange. The pineapple and apple added some sweetness, but the beets and carrots were overwhelming. The ginger wasn’t enough to add any significant kick. The grainy texture was making me twitchy. I was starting to feel very lethargic and a little bit nauseous. There was none of the fabulous energising that the cool kids had blogged about. I just felt bogged down. I was desperate for a big plate of wholesome, greasy American food. Eventually, I made it to the final juice. It sounded so good. Again, perhaps I need to be more accustomed to some of these things in order to appreciate them, but this flavour was sickly. As the sixth pint of liquid in the day, it was difficult to get it down. I was just bored of swallowing fluids. I craved solids. I was so very glad to see the end of it. I could have sworn off juice for life. How anybody makes it through three or five days of juice is beyond me. Some of the philosophy behind these cleanses is that it’s a good idea to let your digestive system “rest” and take a break from dealing with solids. Sounds admirable enough. Trouble is, my gut is pretty picky about a lot of things. It likes to have something to work on. It feels good to have a diet rich in insoluble fibre. At the risk of sharing too much information with you, readers, there is something intensely pleasurable about a good bowel movement – you know what I mean? I now feel like I’m playing catch-up, trying to eat enough of the right stuff to give my gut something to wrestle with. On the positive side, whilst I was craving grease and salt and carbs during the cleanse, the following day I had a very different craving on the palate. I wanted extremely clean food. I had a hankering for salads and beans and lentils, for some complex grains and for some good proteins. Whether that was just the mood I woke up in, or the result of the juice cleanse, I couldn’t say. Would I do it again? Not unless I made my own juices. It was an expensive luxury, and the whole day was a bit of an ordeal. I’d love to be a glamorous, raw-diet-eating, super-healthy blogger, but I’m not. I didn’t feel energised, I was ravenous most of the day, and I was in a terrible mood by the end of it all. It was not worth it. Honestly.